Most people desire the love of a soul mate. Even if we are not completely sure of what that means, the idea that there is someone who can unconditionally love us, despite our flaws and failings is planted deep in our heart. Through our union with another we long to receive love’s mysterious, abundant and eternally satisfying gifts. The lofty vibration of soul mate love often bypasses our rational and logical thinking. It is a soothing balm that speaks to our innermost being. In this way, love is intuitive, as it is through our intuition that we can recognize the impulses of the soul. We all use our intuition in relationships, even when we are not aware that we are. We may call it chemistry, gut feelings, a quivering of the heart or a simple knowing. There are four main ways that we all naturally intuit. An emotional intuitive receives energy information primarily through their emotions. A mental intuitive intuits through their thoughts and ideas. A physical intuitive absorbs energy information through their bodies while a spiritual intuitive receives energy through their energy field and spiritual sensitivities. Knowing your intuitive-love type will help you to better develop your intuitive awareness for use in relationships. Your intuitive love type will assist and guide you in tuning into a potential soul mate connection. Your spontaneous intuitive responses can provide you with much needed clues as to your deeper connection with another. For instance, in the presence of a soul mate, the physical intuitive will experience undeniable physical attraction and chemistry. They will likely feel surges of physical energy and they may need less sleep, eat little, enjoy exercise and have loads of physical stamina. With the increase of higher vibration energy moving through their physical body, they are likely to feel as if they can accomplish any task or goal. The mental intuitive will feel what is called “peak” mental experiences. They will be able to spontaneously understand the meaning behind past perplexing situations and relationships. With intuitive insight into the big picture, they have a sense that everything in life is just the way it is meant to be. Feelings of gratitude for past struggles and unsuccessful relationships, will surface as they become aware that these conditions were necessary lessons on their path to their soul mate. The heart of the emotional intuitive will open wide and they will experience the full emotional spectrum of love. They are likely to experience deep feelings of love, not only for their soul mate but also for the disgruntled employee at the grocery store, the stranger that asks for a hand-out or the relative that has always been difficult. Soul mate love will inspire the emotional intuitive to love everyone and everything. Compassion, forgiveness, and kindness flow freely from them and they cannot contain their joy. The paradox of loving a soul mate is that the love becomes too big for just two people. It embraces the world. Even after first meeting, a spiritual intuitive will feel as if they have known a soul mate forever. The spiritual intuitive may have seen their soul mate in their dreams, in a vision or mediation and they are likely to have experiences of déjà vu with him or her. They will have an inner knowing that they have been predestined to meet this person and that they can now go about the business of fulfilling their soul purpose and mission. Soul-mates inspire one another to transcend self absorbed focus and become a light of love for others. It is important to keep in mind that soul mates do not always love us the way we want to be loved. Instead, they love us the way that we need to be loved, for our healing, growth and ultimate bliss. Soul mates often bring to one another differing perspectives, opposing view points and become a mirror for our strengths and our weaknesses. Every relationship that you are in is important. Each one provides you with an opportunity to heal old wounds and learn more about love and forgiveness. The universe supplies us with endless possibilities to experience love and connection. Even if you are not in a true soul-mate relationship every person you encounter is preparing you for the full experience of love. Soul-mates are never in short supply. It may be necessary that you interact, with and love many people during your life. We sometimes forget that the soul learns through pain and disappointment as much as it does through the lofty feelings of happiness and joy. All we experience is food for the soul. Cherish your relationship misfortunes and disasters. They are the deep, rich tilled and composted soil that the seed of soul-mate love may need in order to grow, sprout and come into full flower. Even when a relationship “fails” you do not have to. Don’t try to outguess the wisdom of love. Trust that there is a higher plan at work and a purpose for every relationship that you have been in and will be in. This entry was posted in Uncategorized on February 14, 2012 by Sherrie Dillard. I had a dream last night where I was holding a baby and walking down a long road. There was a man walking next to me and he told me that he was tired and needed to rest. I crossed a long bridge with the baby knowing that it was now just the two of us. 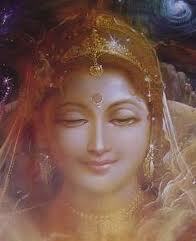 I realize that the dream is about the shift that we are all making into the divine feminine. Male energy needs a rest. Beauty, healing, intuition, creativity, love, all that the divine feminine has to offer is on the other side of the bridge. Everyone is intuitive. Your intuition might surface through your emotions, your thoughts, your body or your spontaneous sense of knowing and your dreams. It often surfaces spontaneously and comes to our aid when we most need it. Pay attention to first impressions. They are often the most accurate. People tell us what they want us to know about them. Rarely if ever will a prospective boyfriend tell you that he cheated on his last girlfriend or a salesperson tell you how inflated a price is. You will likely have no evidence to back up the inner small voice that is telling you to keep moving. Yet, in this kind of situation your intuition is almost always right. Now, I know that you can also check the traffic reports, but often traffic, backups, accidents and other unpredictable occurrences happen in a flash. I do this often, especially on heavy traffic days or when I am driving a long distance. My intuition has never failed me. Invariably when I have had a strong intuition to take an alternative route, I find out of an accident or traffic tie up on my usual way. Your intuition will alert you when have a health concern. Don’t dismiss it. I had a client tell me just this morning that a friend of hers, Holli, has a promising chance of recovery from adrenal cancer. Normally this type of cancer is not found until an advanced stage. Your intuition is an invaluable ally in all areas of your life. The more you listen to it and act on its promptings the more intuitively adept you will become. Trust your intuition and it will soon become a reliable friend. This entry was posted in Uncategorized on February 3, 2012 by Sherrie Dillard.